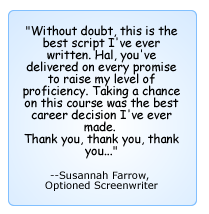 The ProSeries is the flagship of the ScreenwritingU courses – a 6-month, intensive, online Master-class for those absolutely committed to doing whatever it takes to succeed in Hollywood. 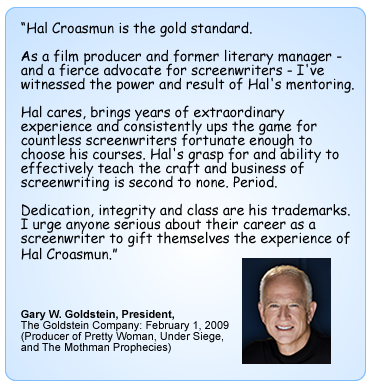 Welcome to Hal Croasmun’s ProSeries! You’ve just discovered the key that unlocks the secrets of great scriptwriting and Hollywood success – revealing to you why some people make it – what they did right – what the majority do wrong and why they won’t ever make it – and how you can learn all the skills and gain all the vital knowledge that will qualify you as a success story! This is one of the most exciting trips of your screenwriting life. At the end of the course, you’ll be writing compelling, moving, and powerful scripts that’ll have Hollywood begging for more . Each ProSeries is an expertly-designed sequence of ten classes (programs) and five teleconferences. Each class runs for about 10-12 days, with generally a week’s break between programs. Each program delivers a lesson each day, with an assignment and generally a 24-hour deadline. Several of the programs involve posting assignments to a forum for those on your specific ProSeries. Analyzing others’ writing, while reading others’ analysis of yours, will result in quantum leaps in your writing skills. In short, the ProSeries is an easy way to accelerate your screenwriting, boost your creativity and spark interest in your work! What Gave Birth To The ProSeries? Hal Croasmun realized there was a gap for a course that would leap-frog the competition – and give writers the skills they desperately needed to succeed. In designing the ProSeries, Hal interviewed 50 producers to ‘force’ them to give up their secrets … and afterwards interviewed over 400 producers to update the course and have it as relevant as possible. At its essence, the ProSeries is about marrying creativity and business so that writers have a real chance to survive and succeed in the tough world of screenwriting. Maybe your scripts are great and Hollywood is already clamoring for you. If so, excellent. But for most people, rejection and disappointment is their only experience. This is where the ProSeries comes in and weaves its magic. Not because they are bad people – but because their workload is crushing. The good new is: the ProSeries will give you the skills to write a script that will not only grab their attention… but make a sale! Why shouldn’t it be you who sells a script for over a million dollars … who gets the fame, fortune and romance of an ultra-successful Hollywood career … who walks the red carpet at the Kodak theater and gets to give a speech for the Best Screenplay Oscar? You will acquire the skills that make for a script that sells. 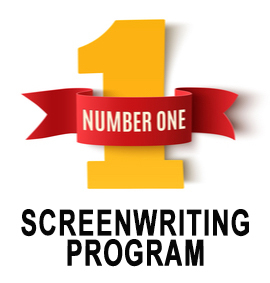 Upon graduation, all successful ProSeries grads are invited into the ScreenwritingU Alumni group – where they rub shoulders with previous graduates. This leads to exciting things, as people start hooking up for high-level discussions and support – and their career starts to happen! Since establishment, the SU Alumni has resulted in over 250 deals made as the Screenwriting Buzz spreads the word! As an Alumnus, you’ll be invited along to special Hollywood Meeting Events to meet the likes of Geoffrey Rush, Martin Sheen, and Michael Madsen – find out what the players want – right from the horse’s mouth! Plus, the SU Alumni are part of the most successful “writers group” on the net where the group talks and works together every day to make each other more successful. Some of the best feedback you’ll ever receive will come from this group, and there are many connected screenwriters here to give advice, and sometimes, to hook you up! Finally, all SU Alumni get to keep up with what’s hot and happening at the SU Alumni page. How is the ProSeries structured? The ProSeries builds a building from the foundation up. Every ‘brick’ is laid on the preceding ‘brick’ in a logical, compelling sequence that – when finished – results in a knockout script – and ultimate Hollywood success. So what are these ‘bricks’? Stage One: Create the foundation of a Marketable Screenplay. Module 1: Create a Marketable Concept in the High Concept class. Module 2: Plotting and Outlining an amazing story. Module 3: Create Characters for A-list Actors. Stage Two: Build in scenes and pages that keep readers engaged. Module 4: Write Fascinating Scenes. Module 5: Create Anticipation, Expectation, and Compelling Description. Turn your script into a page-turner. Stage Three: Elevate your writing to a Professional Level. Module 6: Revealing Subtext Class. Module 8: Make your First Ten Pages Shine. Module 9: Write a Great Ending. Stage Four: Get yourself and your script ready for the market. Module 10: Create a Complete Marketing Campaign for your script. The course also includes two one-on-one phone calls with Hal at various critical stages, to ensure everyone is on track. What Else Are People Saying About The ProSeries? “A wonderful course. More useful than the books I’ve read, the seminars I’ve been to, and the conferences I’ve attended. “What Hal has done with the ProSeries is nothing short of genius. Why do I say that? Because others will tell you WHAT you should be doing, but Hal will show you HOW to do it. Step by step by step, skill by skill by skill. It’s one thing to know a skill in theory, another thing entirely to practice it till it’s a part of your writer’s arsenal. Every scriptwriter on the planet who is serious about his or her craft should absolutely take the ProSeries. Who Should Take The ProSeries? Who Should Not Take The ProSeries? Bottom line: the ProSeries will give you all the help you need to succeed … but you still need to do the work, and maintain a positive attitude. The payoff? A brilliant career, and everything you ever wanted from your scriptwriting. “Many writing teachers will tell you WHAT to do, Hal teaches you the HOW. His system will potentially save a writer many wasted years and give you a real chance to sell your work. I wouldn’t waste another day writing anything without running my ideas through the system he teaches. After 15 years developing Expert Modeling training programs for Fortune 500 companies, Hal Croasmun decided it was time to turn his attention to his true passion – the film industry. 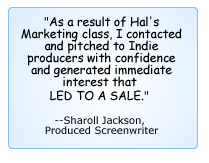 Hal is a Hollywood writer/producer and founder of ScreenwritingU.com, where he has developed a unique Expert Model approach to screenwriting, which is revolutionizing the Hollywood film industry. Over the last 12 years, he has interviewed over 700 producers, 120 agents and managers, and 4 studio heads. These interviews and real experience are the foundation for this amazing program. As you would expect, the entire course is guaranteed. Go through the entire ProSeries and turn in every assignment. At the conclusion, if you don’t feel that your screenwriting has improved by at least 100%, you get your money back plus $100. That’s how confident we are that the ProSeries will quantum-leap-improve your writing! If those three things happen – and you are the judge of “not improving your screenwriting by at least 100%” – then email us and your money plus $100 will be refunded, no questions asked. 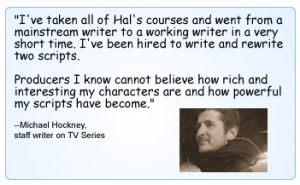 The ProSeries gives you the skills to start writing the kinds of scripts that Hollywood is crying out for. It is the only concept-to-marketing screenwriting course specifically designed from the minds of professional screenwriters and producers. There is nothing else like it. Not any book, website or course ‘out there’ comes close to achieving the levels of professionalism and help that the ProSeries offers. The entire focus is on writing scripts that Hollywood wants to read. By the time you finish, you’ll know exactly what Hollywood wants in a screenplay and how to give it to them. Cost: Regular $1100. $800 if you sign up early! NOTE: If you’ve taken any of the classes included in the ProSeries, please send me a note and let me know what classes you took and on what dates. You’ll get 30% of the price of those classes credited toward the Pro Series. PAYMENT PLAN: $250 up front ($200 toward class, $50 finance fee) and $100 a month until paid off. Here’s to your screenwriting success! PS where will you be six months from now? Will you be selling to Hollywood? If you take the ProSeries, it’s likely that shortly after you finish, you WILL be doing just that! But if you don’t take the course, you’ll probably still be at your current level – which isn’t getting you the results you want now, is it? PPS Of all the courses, seminars and books out there – the ProSeries is utterly unique in crafting all the necessary skills and knowledge you need, one after the other – till the whole scriptwriting picture emerges at the end beautifully. But you will only experience the benefits of all this if you take the plunge and take the course. I entered ProSeries 51. I have to say I was pretty worried it wouldn’t help. So imagine my shock when I had improvements after just the first module. I’ll never forget that first call where I “pitched” my concept and the reaction was “So…now what?”. I didn’t have an answer! The character class is really where I knew I made the right decision though. By the time I had finished that and added the story skills…I couldn’t believe just how much better my script was. And you know what else? I took time off for a year to work on my script on my own but the ProSeries lessons were always in my head making my script better. I was so thrilled with how the ProSeries improved my writing I actually joined one of the Masterclasses. If you’re passionate and serious about it, and you have a really good story and you need to know how to tell it best…I recommend this class for sure. You will create a great script with these skills. I’m so grateful to the ProSeries course. Such a great experience. I gained a deeper understanding of the craft that will be the foundation of all my future projects. My writing improved by more than 100%, just as Hal had promised. I highly recommend this course to anyone who wants to take their writing to the next level.